Scarlett was near death when the Heart of Phoenix Equine Rescue was called to come to her aid. She was starved, underweight, and suffering in 100+ degree heat. It took four people to help her to stand, and she was trailered to a nearby farm. But Scarlett's journey was just beginning. 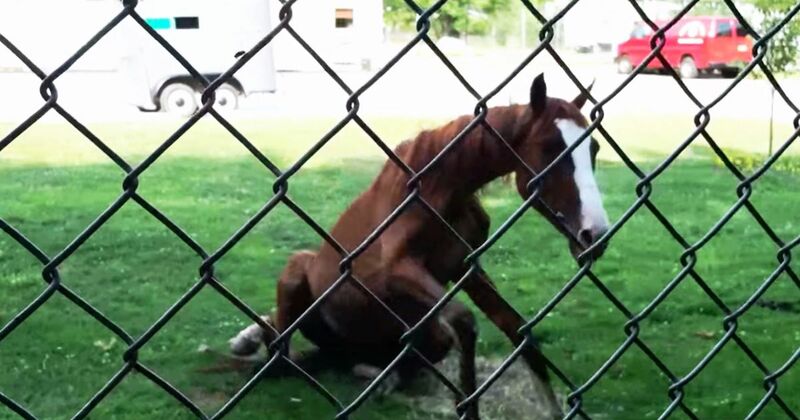 After being seen by a vet, she collapsed in her stall. The rescue team created a sling to support her for three days until she was strong enough to stand again. Scarlett was so thin that you could easily see all of her ribs, and her hipbones protruded dramatically. But like her rescuers, Scarlett was a fighter. Scarlett not only survived the ordeal but thrives today. She was successfully rehabilitated and was adopted by a loving home. When horses have been starved, refeeding them is a bit of an art. According to The Horse, starved horses are in a delicate position. Refeeding a starved horse too much food too soon can actually kill him. Giving a horse too much food too soon can cause heart, kidney, and liver failure. That's why it's so important to monitor the process of feeding a horse very carefully. When refeeding a starved horse, start by having him assessed by a vet. The vet can provide a tailored feeding plan for the horse's needs. In general, feeding small amounts of quality alfalfa is an accepted practice, since alfalfa contains plenty of protein, electrolytes, magnesium, and phosphorus. Frequent, small meals give the horse's digestive system a chance to adjust to the food, whereas infrequent large meals can overwhelm the digestive system. With time, you can gradually increase the amounts that you're feeding the horse while decreasing the frequency of the meals. The first two weeks of refeeding a starved horse are critical to the horse's survival; generally, this is the time when major issues occur. Refeeding a starved horse requires patience, attentive care, and veterinary support. It's a risky scenario, but if it's done right many horses can be rehabilitated and returned to healthy weights.